There's a reason why good fences make good neighbors. I love this guy. He or she looks so wise and so comfortable in the snow bank. 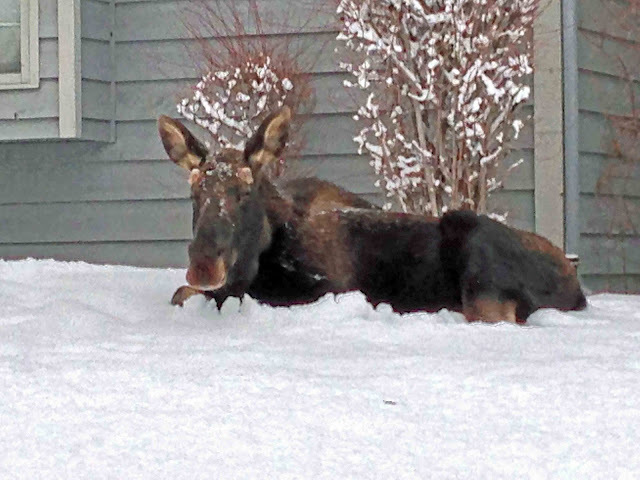 I do miss moose in my yard. Here we have deer, but they are not as impressive by any means. I love it. You guys have all the fun. I have the same problem with the blurry pics. Turns out the lens on my phone is scratched. If you have the iphone they can be replaced not sure about others. I seriously don't know what I would do with moose in my yard. We had a opossum in our backyard a while back, and no one wanted to go outside for days, because it might still be there.